The Garment Factory Era on Saipan has come to an end. From a high of 36 factories back in the mid to late 1990s, the last factory closed on January 15, 2009. Gone are the throngs of Chinese girls walking arm in arm along Beach road. Gone are the vans shuttling the girls from their barracks to shop at and congregate at Fiesta Mall, outside Sunleader Supermarket, San Jose Mart or 99 Cents Store. The girls riding their bicycles to and from work, while holding umbrellas to shield themselves from the sun are few and far between. But while the closures are beyond debate, opinions about the factories themselves, what they represented, and what their ultimate legacy will be in the ongoing story of Saipan rages on. There are those who saw them as a good thing, a boon to the local economy, providing jobs and tax revenue. Others see them as a blight, a blemish on the reputation and perception of Saipan, CNMI. Here are some of the facts of the rise and fall of the garment industry from 1983 - 2009 on the island of Saipan, CNMI, USA. The first garment factory, Commonwealth Garment Factory, Inc. opens on Saipan on October, 14, 1983. Garment factories help the CNMI economy by paying "user fees" and taxes. 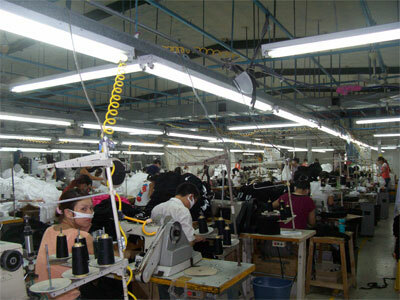 Similarly, an economic study funded by the US Department of the Interior's Office of Insular Affairs (OIA) revealed that at an average of $1,800 income taxes per person, the apparel manufacturing industry which currently employs about 15,000 foreign workers, contributes $27 million in income taxes alone. Aside from contributing to the public coffers through income taxes, each garment worker spends on consumer products. Based on foreign workers' average $50 weekly expenditure, all 15,000 garment workers cumulatively spend $750,000. Acting Labor Secretary Dean O. Tenorio said yesterday that the ongoing headcount of garment workers on island was aimed primarily at counter-checking government records with that of the garment industry and ensuring that the industry in general was within its ceiling of 15,727 nonresident workers. The report said that from $39.3 million in fiscal years 98-99, users fee collection fell to $38.6 million in fiscal years 99-2000. The revenue further spiraled down in 2000-2001 when DoF [Department of Finance] collected only $35.8 million and $30.9 million in 2001-2002. In fiscal years 2002-2003, DoF collected only $29.6 million. To date, DoF has collected $14.8 million in user fees from October 2003 to March 2004. 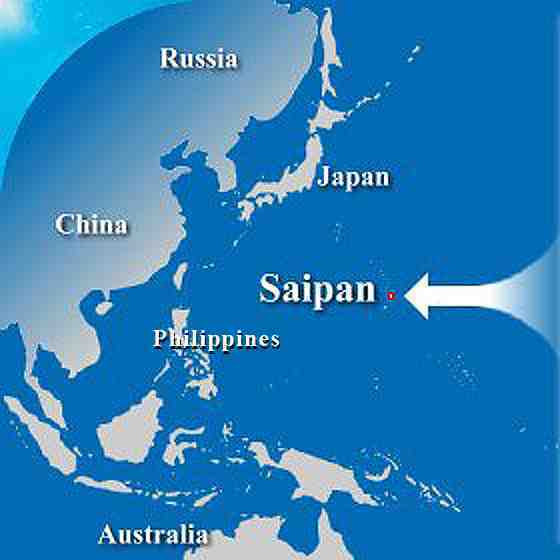 CNMI used to have 34 garment factories, all located on Saipan. The garment industry used to contribute some $60 million in direct taxes a year to the local government. Garment exports took a major leap in 1997, increasing by $235 million from $513.7 million in 1996 to $748.6 million. 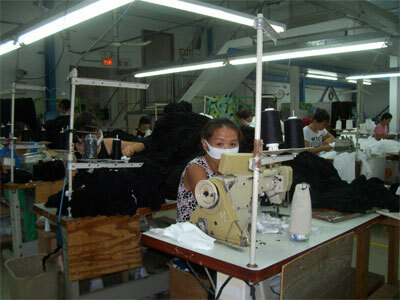 The Saipan garment manufacturing industry exported close to $1 billion worth of apparel products to the United States in 1998. Tribune: By end-1998, apparel exports from Saipan totaled $994.6, marking a $246 million increase from year-ago figures. The Quarterly Economic Review prepared by the Central Statistics Division of the commerce department noted that garment exports amounted $267.6 million in January-March 1999. The figure fell to $258 million the following period. At least 22 garment factories on Saipan were named defendants in the class action suit filed in the District Court here. It is the biggest court action facing the local garment industry. Among the companies named in the suits were The Gap, Cutter & Buck, Dayton Hudson, J. Crew Group, J.C. Penny, Sears Roebuck & Co., The Limited, Oshkosh B'Gosh, The Gymboree, the Associated Merchandising Corp., the May Company, Lane Bryant, Wal-Mart, Tommy Hilfiger, and the Warnaco Group. Major buyers of Saipan-made apparel products include the Gap, Liz Claiborne, Tommy Hilfiger and Ralph Lauren's Polo line. Aug 6, 2000: Saipan Garment Factories Association (SGMA) suspends Eurotex, Inc. for "non-compliance with the SGMA Code of Conduct, substantial and persuasive evidence of a willful disregard of the codeâ€¦"
The Zhida Market Savings Scam comes to light; Chinese couple Lin Zu Xiu and Li Rui Yuan convinced garment workers to deposit their money at Zhida Marketin Garapan in return for a high interest after a month or two; Some factory girls lose in excess of $20,000 each in savings. Media reports amount scammed exceeds $100,000. Number of victims, approximately 45. Long City Traders Savings Scam; LCT is a jewelry shop that also offers financial services. Garment factory workers were misled into depositing their money with the company in exchange for higher interest rate. Number of victims: approximately 700. Owner, Kwan Yeun Cheung, fled to Hong Kong on Jan. 6, 2001. Garment trade quotas end on January 1, 2005. Five factories close this years: Sako Corp, Neo Fashions, Express Manufacturing, Inc., Mariana Fashions, Inc., and Winners I. Six factories close this year: Concorde, Hyunjin Saipan, Inc., Am. Pacific Textile, Hansae Saipan, Handsome Saipan, and Poong In. In fiscal year 2006, user fee collection was about $19.5 million. On Oct. 31, 2007 Jin Apparel Inc. filed a formal notice to Labor about its planned to suspend business operations from Dec. 31, 2007 until March 31, 2008. Sam Kwang closes a few days earlier than scheduled. User fees for the first 10 months of fiscal year 2008 totaled $4.79 million. October 31, 2008 â€“ Garment Oversight Board (GOB) dissolves. 13,000 checks were mailed to members of the class action suit. 4,000 checks have not cleared. 1267 checks ($180,000) came back undeliverable. All the money from the class lawsuit settlement that garment workers fail to cash will go to a Garment Workers Trust Fund, according to GOB chairman Timothy Bellas. January 15, 2009. The last garment factory closes. 1. Eurotex Inc. was the first local factory to shut down in 2000. 4. Concorde Garment Manufacturing Inc.,(2001/2006) (in 2001, Global Manufacturing and Trans-Asia merged with Concorde Garment Manufacturing Inc., only to shut down in 2006. (aka Concorde Garment Manufacturing/L&T International Corp.
5. NET Apparel dba Suntex Manufacturing Corp., merged with UIC, and Trans-America merged with Handsome Saipan Inc.
7. Trans-America merged with Handsome Saipan Inc.
19. 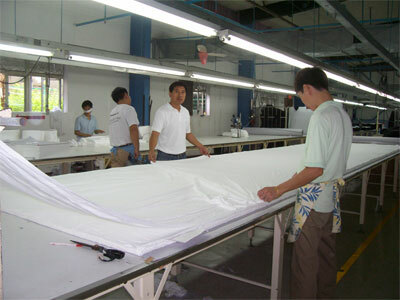 American Pacific Textile (2006) (In 2006 Hyujin Saipan, and American Pacific Textile shut down their factories. 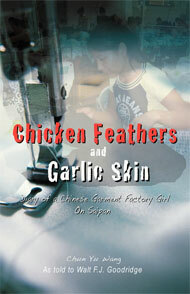 NOTE: "The Rise and Fall" as well as more revealing information, appears in the appendix of the book, Chicken Feathers and Garlic Skin: Diary of a Chinese Garment Factory Girl, available on Amazon.com or at www.SaipanFactoryGirl.com. Saipan, CNMI--Almost twenty-six years after the first one opened in October, 1983, the last garment factory on the US territory of Saipan will close its doors January 15, 2009, ending a controversy-plagued era on this island in the Western Pacific. Saipan was home to a once-thriving garment industry which, at its height, hosted 36 factories which employed over 15,000 contract workers (mostly women from China, and many from Thailand, Philippines and other Pacific Islands), generated (taxes) of $40 million/year for the CNMI government, and $994 million in annual exports to the world. "It's a fascinating story, but much remains hidden about what things were really like here," says Walt Goodridge, columnist for the Saipan Tribune, and editor of Chicken Feathers and Garlic Skin, the only known first-hand account of the life of a Chinese garment factory worker on Saipan. "Opinions vary, but most workers felt it was a benefit to earn the money they did. When the last factory closes in a few weeks, it will mark a significant turning point for the island's now primarily tourist-based economy," Goodridge added. Saipan's unique relationship with the US allowed manufacturers to have "made in the USA" labels on garments sewn there, while benefiting from lower costs and a non-US regulated working wage paid to a mostly female, non-resident workforce. As the trade tarrifs lifted, conditions became less profitable, and factories began leaving Saipan for other profit-friendly regions. In 2006, a Ms. Magazine article with allegations of labor abuse, corruption, and cover-up, along with class-action suits against factories, turned the media spotlight on Saipan, and government official complicity, and has tainted the island's image with associations to convicted lobbyist Jack Abramoff. Many hope Pres. Bush's recent designation of the world's largest "no-take" marine preserve around the nearby Mariana Trench will launch an era of opportunities and new image for the island. Visit SaipanFactoryGirl.com/facts.html for a 25-year industry timeline, income statistics, important milestones, dates of closures and a complimentary excerpt from Chicken Feathers and Garlic Skin.